No one can accuse Minnie Mouse of being a wallflower on her 90th birthday! Dressed to impress in a multitude of colors, she flaunts her polka dot skirt, bow, and graphic tights, while sparkling crystals add a touch of bling to her round-toed pumps. 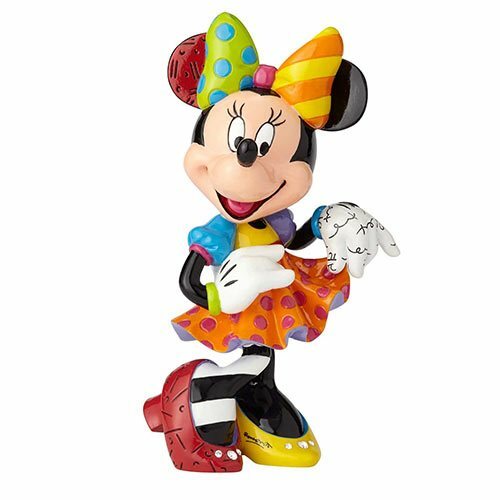 Handcrafted and hand painted, each Disney Minnie Mouse with Bling Statue by Romero Britto is as flawless and unique as Minnie's style. This glossy stone resin piece stands an impressive 10 1/4-inches tall. Collect it and the Mickey Mouse with Bling statue (sold separately) to complete the fashion-forward set, and brighten the day of the Disney fan in your life!